One of the things I absolutely love about my wife is her ability to constantly encourage me and feed into my insecure self. She reminds me regularly of who God made me to be. Sunday was a pretty busy and good day. Leading worship in the morning. Connections lunch with Ed and Brandon after church. Leading a meeting for our Mexico missions team from 3-5. Rachel took off right after that meeting to drive to SoCal without me to visit friends and family. Just wanted to make you all jealous because my wife is the bomb. Thanks for the constant encouragement babe. Rachel rocks…HHBL: Hot Ham Bacon Lettuce. She wants a sandwich when she gets home. hey dude your wife is awesome glad to see everyone is doing good at clc. Love and God Bless You Guys. P.S. She is a awesome wife just for the record. Dang, I impressed myself!!!! Do I win something? That is so sweet and yes your wife is the BOMB!!! 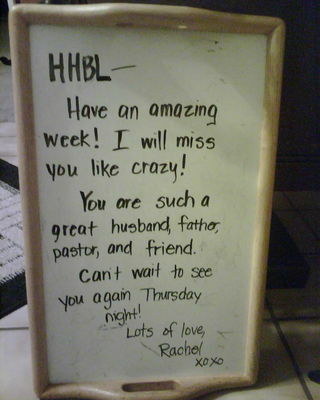 Your pretty blessed to have a wife like Rachel. Do share……HHBL Hunka, Hunka, of Burning Love???? LOL. Yeah. At first, I was a little embarrassed when Ryan saw it at the house. But then I thought, dude, my wife is rad. I should let everyone know! Glad my wife is a good sport too! I’m not sure how I feel about my note to you being posted all over the internet! If I knew that I probably wouldn’t have addressed it to HHBL! Miss you. Have a great week!